This impressive Star Back centrepin reel with inner brass flange measures 5 inches in diameter & probably dates to the 1920's. Fitted with an optional check it's large size suggests it was intended for use in salmon fishing and is a robust reel weighing just over 600 grams. Probably made from walnut, the reel is generally in good condition and functional enough for modern use, or as an attractive display piece. Please note the packing washers under the wingnut are later replacements. A nice example of a classic starback centrepin reel incorporating a Slaters catch for quick release access to the inner mechanism. Measuring 3.5"diameter it's fitted with an optional check and the drum inner flange is brass. It probably dates to the early 20th century and the wood appears to be mahogany, with twin horn handles. It doesn't have a makers name but a quality piece in great condition, it spins freely & is a pleasure to use. A superb 4" brass plate wind, constant check Salmon fly reel signed ‘A & N C S L, 117 Victoria St S.W’, which stands for Army & Navy Co-Op Society Ltd. This is a rare piece which dates to the turn of the century, and still retains virtually all its gunmetal finish. In full working order and excellent condition, a classic reel which is still a joy to use today. This is a rare piece by one of the most iconic makers in the development of the sport of angling and is in excellent condition. A classic reel in working order which is still a joy to use today. A very nicely restored Nottingham style 5" starback centrepin reel reel with a beautiful brass line guard. Fitted with optional check, and dating to between 1915 - 1920, this is a showpiece reel, still very usable as well as looking great. Unsigned, and in fine working order. Fitted with a constant check and horn handle, it really is in very good condition as can be seen from the photos. A rare collectors piece in full working order. This is a classic starback reel incorporating a Slaters catch and brass line guard. Measuring 4" in diameter, the drum inner flange is brass, and I think the wood is oak. This is a really eyecatching reel in very good condition, and has an optional check. Not sure of the date but would estimate around 1930's. Unsigned. Impressive 6" diameter Allcock Starback reel with inner brass flange, and brass line guard In really superb condition, not only is this reel of large proportions, but visually stunning, check out the photos to appreciate the rich color of the mahogany. Fitted with strong optional check, this is likely to be a sea reel or large salmon, dating probably to the 1920's or 30's. Engraved S.Allcock & Co Ltd, Makers, Redditch, ENG. No question this sturdy reel was built to last! 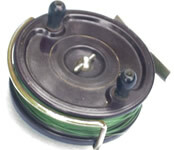 4" diameter Hardy Marquis Salmon no1 fly reel, in good condition although showing some paint loss on backplate and rim. Has adjustable ratchet and there is some line left on the reel. In excellent working order. Allcock Aerialite fishing reel, bakelite construction with brass line guard. Measures 4" diameter with stong optional check. A nice reel to use in super condition. Allcock 3 1/4" alloy trout fly reel. Have not been able to identify the model name but almost certainly a Dingley type, fitted with red agate line guide set in nickel frame and rim mounted tension adjuster, probably dates to the 1930's. Backplate stamped with makers name and Stag trademark.Some paint loss but generally in good condition, great reel to use. Scottish reel by M.C. Thorburn, Edinburgh. 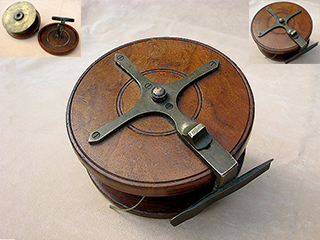 Alloy construction with brass foot, measures 4" dia x 2" in depth. Fitted with rim mounted tensioner, and inner ball bearing race. Retains most of its original finish and in excellent working order. As good to use today as when it was made circa 1930.